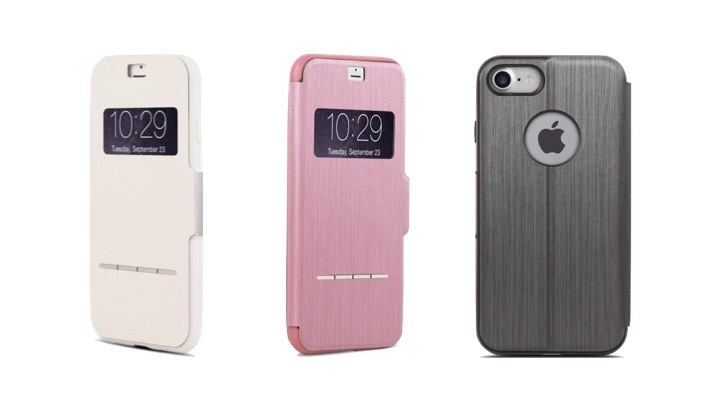 Moshi’s SenseCover case offers up comfort, ease of use and protection! We Apple lovers tend to go naked when it comes to our iPhones, but as they got more slippery we seemed to be dropping them more and more. Now me an Apple tech and podcaster pays a lot of attention to peoples mobile phones. More and more people are putting their phones in cases for protection and individuality. This case is made of a tuff polycarbonate shell which holds all four corners of your iPhone, but not so tight you think your breaking it putting it in and taking it out! It has a nice “leatherette” cover all over and a simple magnet to hold it shut. The back has openings for the camera and flash and Apple logo, while the front is open over the ear speaker. The rim of the phone is protected all around with openings only for the silent switch, speaker and Lightening port and headphone jack on the iPhone6 versions. The SenseCover has a clear vision area where the time and date or caller ID shows through AND the secret SensArray pads that show as silver dashes on the front cover that allow you to answer the phone just by sliding your finger across the pads, easy as. Another nice little touch is the ability to sit your iPhone at a nice viewing angle to watch videos, etc, hands free in a choice of pink, black or beige. Disclosure – we are ­not paid to give product reviews, good or bad.